Decorating for an All Hallows’ Eve monster bash can be frightful … for hosts. 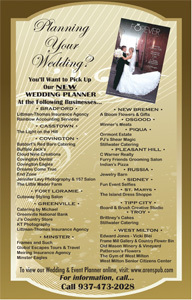 From the invitations and decor to the entertainment and favors, it can be quite an undertaking. But there’s no need to fret. You can haunt your Halloween party with easy do-it-yourself decor and crafts. Nelson recommends these fast and fun ways to sprinkle a little black magic over your home decor and get the Halloween party started. * Light the way to the party by crafting your own luminaries to line the walkway to the party entrance. Paint witch hats and jack-o-lanterns in black on the outside of mason jars, and place a tea light in each jar to illuminate the path to the party. * Tear old burlap bags to look like cobwebs and hang them across the front porch. Add a few bats cut from black construction paper as finishing touches. * Hang last year’s holiday lights to outdoor windows in the shape of spider webs using Command Outdoor Light Clips, and dangle creepy crawling spiders and menacing bats from temporary clear window hooks. * Up-style inexpensive party banners by embellishing them with decorative tape and scrapbook paper. Hang them from Command Party Banner Anchors in the foyer to welcome guests as they arrive. The adhesive anchors won’t leave your walls spooked when it’s time to remove the decorations, and you can use them again to decorate for your next shindig with clear refill strips. 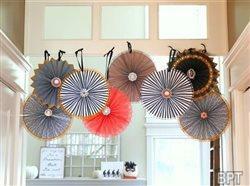 * Create paper medallions to hang in entryways throughout the space. Make accordion folds to long, rectangular pieces of paper, and then staple the two ends of the paper together to create a pleated circle. Add a piece of ribbon, and hang them above doorways. They’ll move and sway above guests as they enter and exit rooms. * Create a homemade “pin the hat on the witch” party game. Paint a poster board with glow in the dark paint and cut out a witch, broom and several witch hats from black construction paper. Glue the witch and broom to the poster board, and hang the board on the wall. When it’s time to play, just turn the lights off and enjoy endless fun watching guests try to tape the hats to the witch. * Skip the goopy mess of carving pumpkins this year. Instead, let guests customize pumpkins of all shapes and sizes using colored and patterned tapes and other unconventional embellishments like lace and sequins. They make great takeaways. * Turn a pumpkin into candy bowl (no magic required). Simply cut off the top of a pumpkin and scrape out the pulp and seeds. Once clean, insert a plastic bowl into the pumpkin and fill it with candy, spider rings and other goodies. * Rather than spending money on bags to give to guests at the end of the bash, fill vinyl gloves with the favors. Long, thin candies fit best in the fingers of the gloves. Then just seal the glove with ribbon and “hand” out to guests as they leave. For more party decorating and entertaining tips, visit Command.com.